No Restrictions in the Women’s Division. But a team can only have a maximum of 2 players from the National Team & UAAP playing at the same time. 2) 12 MINUTES PER GAME. 3) GROUP STAGES (SINGLE ROUND ROBIN). 4) TOP 2 TEAMS ADVANCES TO THE KNOCKOUT STAGES. 5) MEN’S 3RD DIVISION (UFL, NCAA & UAAP PLAYERS ARE INELIGIBLE). 6) WOMEN’S DIVISION (MAXIMUM OF 2 PLAYERS FROM THE NATIONAL TEAM, UAAP & NCAA CAN PLAY AT THE SAME TIME). 7) PLAYERS NOT WEARING THE COMPLETE OFFICIAL TEAM COLORS WILL NOT BE ALLOWED TO PLAY. -IN THE SPIRIT OF THE FAIR PLAY CAMPAIGN OF F.I.F.A. * OBSERVE THE LAWS OF THE GAME. -THE RULES ARE SIMPLE, LEARN & FOLLOW THEM. * PROMOTE THE INTERESTS OF FUTSAL. -FUTSAL IS A GREAT GAME, LET US PROMOTE IT WELL. THINK FIRST BEFORE DOING SOMETHING THAT MAY NEGATIVELY AFFECT THE IMAGE OF THE GAME. ENCOURAGE EVERYONE TO WATCH & PLAY THE GAME WE LOVE. BE A GOOD AMBASSADOR OF THE GAME. -EVERYONE HAS THE SAME RIGHTS, INCLUDING THE RIGHT TO BE RESPECTED. LET US SHOW RESPECT TO TEAM MATES, OPPONENTS, SPECTATORS, REFEREES & OFFICIALS AT ALL TIMES. *The Champions in the side events competition will win special Futsal Apparels. 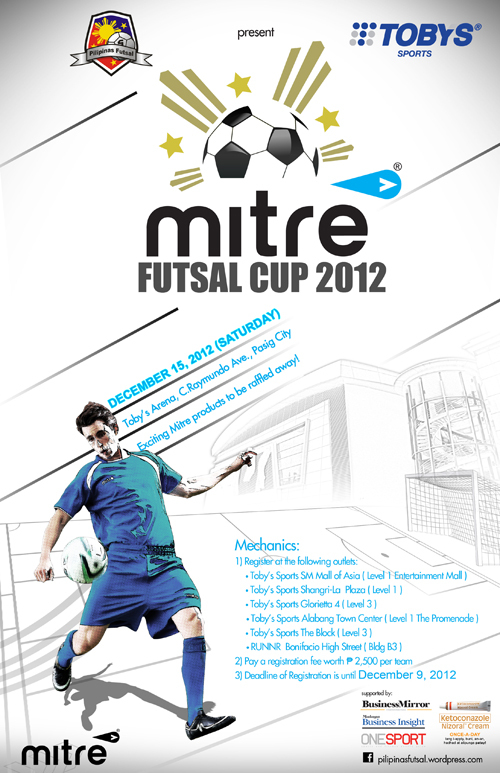 *The top teams in the Futsal Cup will win special Mitre Futsal Balls. *Every Player from the Champion Team in the Futsal Cup will also win Mitre Futsal Cup Shirts.